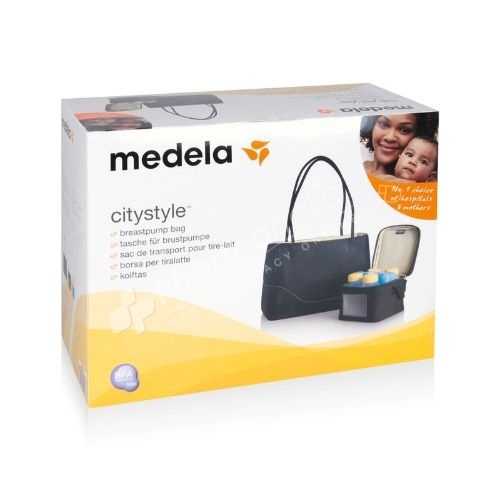 Medela City Style Breast Pump Bag is specially designed to transport your breast pump, pump accessories and cool bag safely and easily. Medela has developed a system so that you can keep your expressed breast milk cool and safe – even when you are on the go. The CityStyle bag has been specially designed to transport your breast pump, pump accessories and cool bag safely and easily. Medela has developed a system so that you can keep your expressed breast milk cool and safe – even when you are on the go. The Medela CityStyle breast milk carrying bag comes with a removable cool bag, four breast milk storage bottles and a specially shaped cooling element that will keep your milk cool for longer.